Yosemite National Park has always been my favourite place since my drive along the Tioga Road back in 1985. Yet this was my first visit into Yosemite Valley. 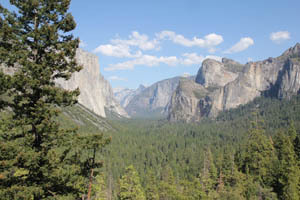 I was full of anticipation on the drive of 80 miles from Merced into the Valley via Arch Rock Entrance. I wasn't disappointed. 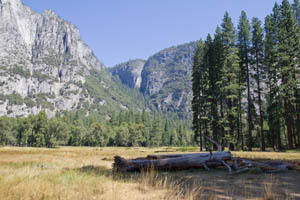 Our first stop at Sentinel Beach offered a glorious view of the Merced River which confirmed my love of the place. We had planned a circular walk of about 5 miles around the valley floor, starting from Cook's Meadow. However after a little while we found ourselves walking through a wooded area and not seeing much of the valley other than tree trunks and the ground. So, a change of plan, instead we caught the valley loop shuttle bus from Camp 4 to El Capitan Bridge where we had a walk along the river and enjoyed seeing El Capitan from up close. Then back on the bus to return to Yosemite Village for a look around before catching the shuttle bus back to where we had parked the car at Sentinel Beach. On the bus we learned from the driver that standing next to the tame deer could be dangerous as their hooves were razor sharp and cold easily cut through an artery in your leg. We next headed to Tunnel View to see the famous view of the valley and then continued on up to Glacier Point for a more distant view before saying goodbye to Yosemite for the night. After returning to the hotel in Merced we checked online about the Tioga Road to find out that it had been opened at noon today, so tomorrow's planned route was on!